Brass (actual name: Sailor-Multi) is a Medarot belonging to Erika. Brass is a Sailor type (or SLR-191218 type) Medarot, who possesses an ordinary Beetle type medal. Her personality is that of a young, polite school girl. Brass spends most of her time helping out in Erika's journalist career, acting as the camera girl, and so, she rarely fights. However, when she does robattle, she is a tough opponent. She helped Metabee by helping Erika gather parts to fix Metabee's targeting lens while running away from two Kilobots and their two crazy kilofighters. 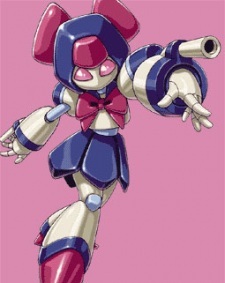 She also saved Metabee from Clay Golem, and assisted him in their robattle against the Ninjas. Brass is fundamentally a slow shooting Medarot. However, she has an extremely accurate targeting system built into her optics.